The Town of Light, developed by LKA Inc. and published by Wired Productions, was showcased at PAX East for their upcoming release of the game on PlayStation 4 and Xbox One. LNGamers’ own Meghan Rodriguez reviewed the game on PC and found that it “made quite an impact” because the story was “saddening and massively terrifying”. She recommends the game to anyone looking for a great story based on true events. An outside view of the Italian facility. 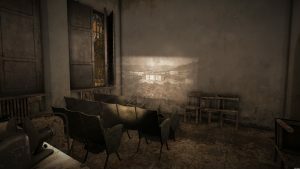 The console edition (as well as a patch coming to the PC version) will feature more collectible items throughout the game to further tell the back story of the facility as well the patients that stayed there. These collectibles will include original photos of the facility, hand written letters and other additional items. Actually, one of the first things I noticed when playing The Town of Light at PAX East was the vast number of items that could be picked up or viewed from the very beginning. 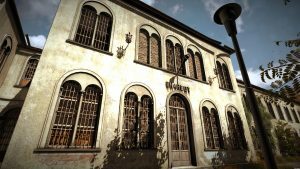 Before I even sat down to play the game I spoke with ONE PR Studio Publicist, Cody Martin, who discussed how true to life the asylum, located in Italy, actually was. I saw several photos of the entire facility as well as how the interior looked after it had been abandoned and I will say that the team did a great job recreating the immensity and the emptiness that one would feel if they were touring the real place. One of the many abandoned rooms that can be explored. I played the game on Playstation 4 and it looked great. I am a huge fan of exploration games that tell a story and, although I only sat through a short demo, I felt like I could have been pulled in to play for hours. The developer that was guiding me through the demo was helping me to progress through the environment because the sheer size and scope of the game would have taken me a long time reach “the end”, especially since I wanted to stop in every room and find every newspaper article, journal entry, medical encyclopedia, or note that I could. I never played the original game on PC, but this new version seems jam-packed with additional storytelling material. I’m excited for the console release to be able to get the full story and I know that Meghan will want to replay the game for all the new content. Thank you to Wired Productions and LKA.it.